ICANN today published the Phase 2 Cycle 2 report of the WHOIS Accuracy Reporting System (ARS), which acts as a follow-on to the Phase 2 Cycle 1 report [PDF, 1.7 MB] published in December 2015. During Cycle 2, ICANN again measured both the syntax and operability accuracy of WHOIS records in gTLDs as compared to the requirements of the 2009 and 2013 Registrar Accreditation Agreements (RAAs). 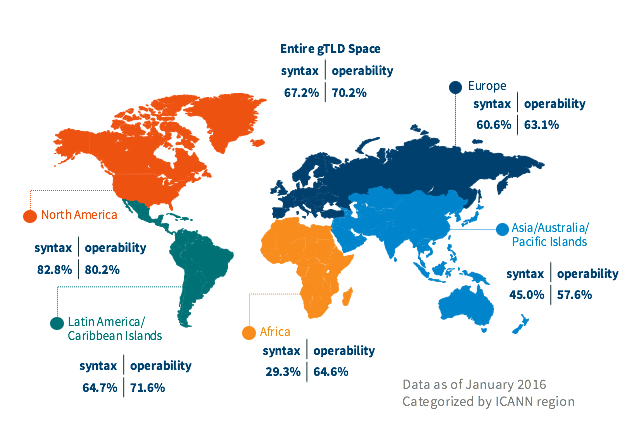 The Cycle 2 report discusses the leading types of nonconformances, trends and comparisons of WHOIS accuracy across ICANN regions, RAA versions and gTLD types. The results of Cycle 2 have been provided to ICANN's Contractual Compliance team, which will assess the types of errors found and follow up with registrars on potentially inaccurate records. If WHOIS inaccuracy and/or format complaints are created from the WHOIS ARS data, ICANN Contractual Compliance will issue tickets in accordance with the Contractual Compliance Approach and Process [PDF, 292 KB]. Compliance provides updates on a quarterly basis, which include updates on WHOIS ARS tickets and can be found here.